I'm reinvigorating an older large painting that I absolutely love. The painting shows the front of the house of my former Feldenkrais practitioner so I think of it as my "healing tree." She is a retired ballerina who works out of her house in the inner Sunset. Her therapy got me through a difficult time when I was in a lot of physical pain. I feel peaceful when I think of walking up her (very steep) steps, seeing that tree, and knowing that I'd feel better in an hour. The painting is rather large, 3 x 4 feet. It moved to a new home with me a few years ago and, like many of us, needs a mild facelift. I'm reapplying some of the paint, adding new texture and a few improvements. This week saw a big burst of painting, and I'm excited about the progress of my Alameda piece. Using oil paint and colored pencil, I did a modified version of my typical wavy water pattern. I like this more subtle approach. Played with a speckled texture for the rocks and started laying in the grass and wood patterns. Once this is dry, the next stage is to finish the rocks, grass and wood. 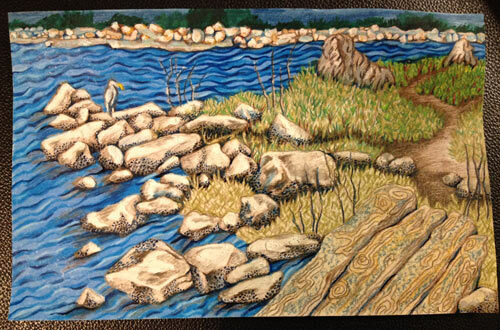 Maybe do more with the background shoreline but not much because I want to keep it a bit abstract. Here is stage 1. 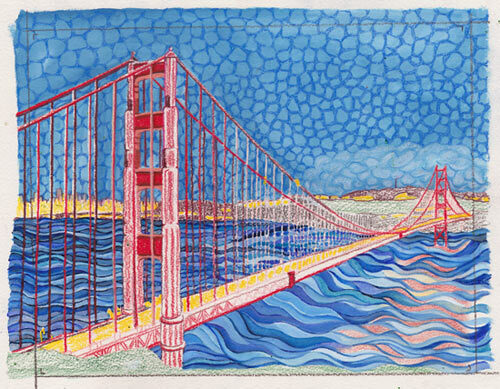 It’s my Golden Gate Bridge obsession, back for the fourth time. Or seventh or 20th, depending upon whether I count failed attempts of the past. The underpainting was sketched over a light table on medium-weight watercolor paper. I've applied a light oil wash over the colored pencil. Here is the red pencil underpainting. I’m packing up this massive hulk of a painting for awhile, since it’s been languishing on my wall and is intrinsically unfinished. There are many layers of years and paint on this thing. Spent a few hours at sunny Fort Funston today. I managed to get most of a sketch done before Sugar Bear shook water and sand all over it and me. 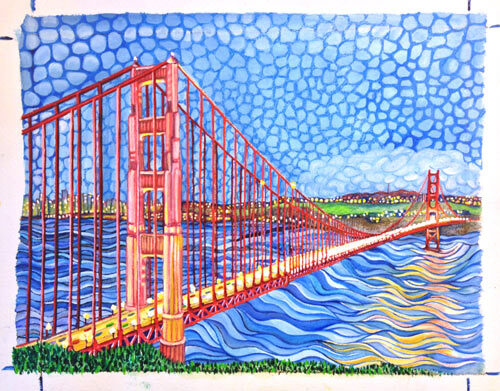 The next stage of my Golden Gate painting. I added the first layer of color with oil washes, oil pastels and a little bit of oil bar. Next step is to paint in contrast. Love those oil bars, especially the tactile quality of stripping the stick of its skin. But the material samples are a little large for the size that I currently work at, so lately I’ve used them sparingly. Here is stage 1. I think the line structure of the underpainting has held up nicely. Further work on a view from the penthouse suite of the Adagio Hotel in downtown San Francisco. 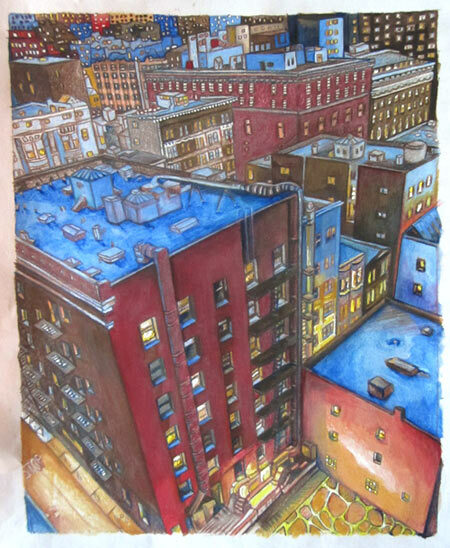 The palette is based on the actual colors of the scene, as blue spotlights hit the buildings and created a beautiful contrast with their browns, yellows and reds. I've filled in the forms with heavy colored pencil, and started to add oil pastel in the windows and trim. It is a slowwww process.